← Revisiting the Rangers third line possibilities: Stack the size? The Rangers have not had a really good offensive, puck moving defenseman in over a decade. 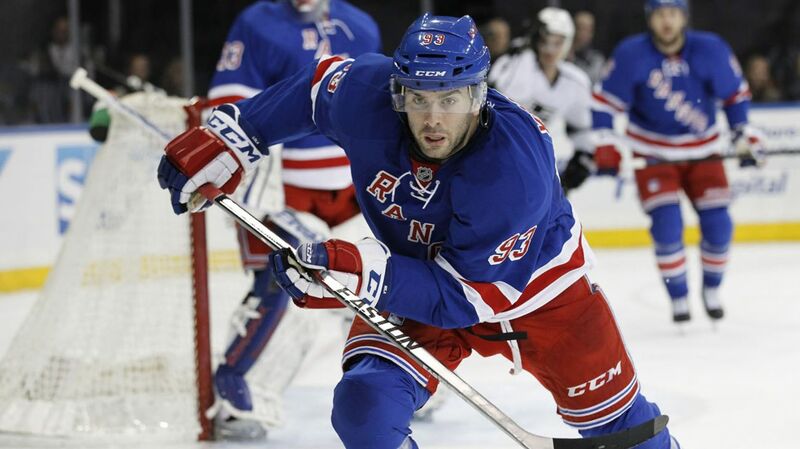 Now that they do have one in Keith Yandle, it’s time for Vigneault to utilize him in a top-pair role. Photo courtesy of MSG Photos. Ever since making his NHL debut with the Rangers back in the 2010-11 season, McDonagh has spent the majority of his career, especially in recent seasons, paired alongside Dan Girardi, the veteran defenseman that has played his entire career in New York. For the most part, the pairing has been very successful, regularly playing 20+ minutes a night, facing the best of the best in the NHL, and limiting the offensive capabilities of the other players for the better part of the past four seasons. But for the upcoming season, Alain Vigneault may want to consider breaking up that longtime defensive partnership, and instead having the captain play alongside Keith Yandle, who will be playing in his first full season with the Rangers. Let’s face it. Dan Girardi does hold McDonagh back in some aspects. I’m a fan of Girardi’s, and I think he has been very good for the Rangers during his career, but he’s good in a different way. Girardi’s game is purely defensive. His main goal is to do whatever he can to stop the puck from going into the back of his own net, whether that be playing physical, using his stick, blocking shots, or positioning himself well. But he doesn’t bring all that much on offense, and he’s not a great puck mover. Ryan McDonagh is a true two-way defenseman. At times, he plays like he’s the best defender in the league, able to totally shut down the likes of Sidney Crosby and Alex Ovechkin. What makes him special is that he can follow up his stellar defensive play with a great outlet pass, a blast from the point, or passing in the offensive zone. He’s near elite in both ends of the ice, and he needs to be paired with someone that complements his skills. Keith Yandle appears to be exactly the kind of player that McDonagh could use by his side. Throughout his career, he has been known for his fantastic offensive abilities, both at even strength and on the man advantage. He’s got excellent vision, leading to a lot of great passes as well as some goals every now and then. Just look at this pass he makes to current Anaheim Duck Carl Hagelin for a breakaway goal against the Pittsburgh Penguins. That is the type of puck movement that the Rangers should be utilizing throughout the game, instead of just on the power play, or for 14-16 minutes a game. Instead of having Yandle waste away on the third pairing, have him play top pair minutes with McDonagh, who in my eyes, could be a serious Norris Trophy contender in the future. Yandle is also coming off of another fantastic season, one that saw him total 52 points (6-46-52) in 84 regular season games. It was the second consecutive season that he tallied 50 points (8-45-53 in 2013-14), and his third overall. Yandle has also finished with over 40 points in five of the six seasons where he has played 50 or more games. He has reached the double digit mark in goals four times, and he has 332 points in 579 career NHL games. Needless to say, he’s an elite offensive defenseman. Yandle played 21 regular season games with the Rangers, collecting 11 points (2-9-11) in that span while mostly playing on the third pairing. It took him some time to adjust to the new system and his new teammates, but once he settled in, he was fantastic. Over his last 12 games with the Rangers during the Regular season, Yandle tallied 10 points (1-9-10), and was really helping generate offense from the blue line. The power play continued to struggle, but Yandle certainly helped it run more smoothly, with quick passing and better scoring chances. He really came into his own during the playoffs, where he totaled 11 points (2-9-11) in 19 games, collecting seven of those points (2-5-7) in the seven game series against the Tampa Bay Lightning. He was injured in Game 2 against the Penguins, spraining the AC joint in his shoulder. That had an effect on his play, and as he healed, he played better. Keith Yandle and Ryan McDonagh hi-five after combining for a power play goal against the New Jersey Devils. Photo courtesy of Getty Images. The advanced stats for Yandle in the playoffs also lean in his favor. For the playoffs, Yandle finished with a 52.7% Corsi as well as a +4.9% Corsi Rel. That means that when Yandle was on the ice, the team had more possession and shot attempts, and almost five more scoring chances per 60 minutes, which is pretty good. He led all playoff defensemen in points per 60 minutes, with a minimum of 200 minutes played. On top of that, he was fourth overall in points-per-60 at even strength. When taking a look at his “Hero” chart, with data from the last three seasons, his goals/60 minutes, primary assists/60 minutes and primary points/60 minutes are all on par with that of a top pairing defense. While he doesn’t help out all that much when it comes to suppressing opposing shots and chances, his impact on his linemates’ corsi, as well as his own, is very, very impressive. Having Yandle play on the third line for 15 minutes a game isn’t doing him, or the team, much good at all. Ryan McDonagh needs to have someone paired with him that can complement his offensive abilities. McDonagh had 43 points during the 2013-14 season, and despite dealing with injuries and a lot of stress this season, still managed 33 points. There’s no reason why he can’t hit the 50 point mark eventually, especially as he grows more comfortable with being the captain of the Rangers. Pairing two 50 point defenseman together would give the Rangers one of the best pairings in the league. 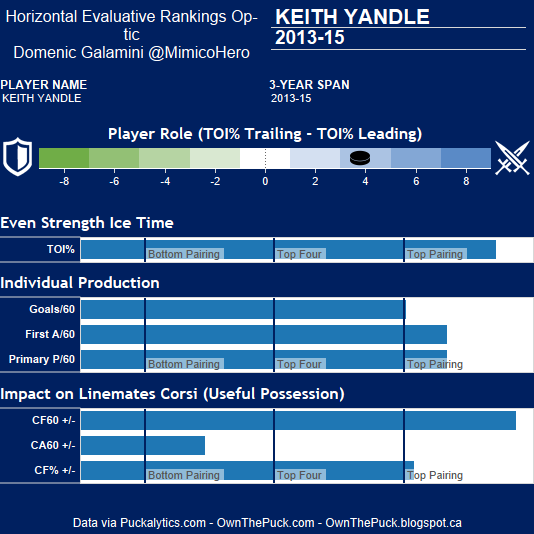 Yandle will never blow you away defensively, and he’s really only average in that department. But McDonagh would certainly be able to pick up the slack, and Vigneault would not have to start McDonagh for defensive zone shifts all of the time, allowing him and Yandle to use their skills and create more offensive opportunities. Also, think of this. Yandle was tallied all of those points with a very lackluster Arizona/Phoenix Coyotes team, who really only had success in 2012 when they when they went to the Western Conference Finals. Now that he’s familiarized with Vigneault’s system, a style of play that suits him very well, I’m very intrigued to see what he can do for a full season when passing to guys like Rick Nash, Chris Kreider and others. Dan Girardi and Marc Staal played together before the Rangers acquired McDonagh, and they created a very good partnership. This is the duo that Vigneault can use on the majority of the defensive zone shifts, mainly because they are both defense-first players. That would leave Kevin Klein and Dan Boyle to pick up the remaining minutes as the third pairing. Of course this means that either McDonagh or Yandle would have to switch to the right side, but McDonagh already did that during the Olympics. Having Yandle by his side would allow the captain to utilize more of his offensive skillset, generate more offense from the blue line, cycle the puck a lot better, and hold the majority of possession, while also creating a potential shut-down defensive pair in Staal and Girardi. Posted on August 19, 2015, in In the Crease and tagged Blueshirts, Broadway Blueshirts, Dan Boyle, Dan Girardi, Keith Yandle, Keith Yandle Rangers, Keith Yandle stats, Kevin Klein, Klein trade, Madison Square Garden, Marc Staal, MSG, New York Rangers, New York Rangers blog, NHL, NHL 2015, NHL 2015-16 season, NYR, Rangers, Rangers blog, Ryan McDonagh. Bookmark the permalink. 2 Comments. All due respect, this is more like a match made in Ranger hell. McD is this generation’s closest thing to Brian Leetch, right? So who do you pair a defenseman who likes to rush the puck often than not, a Jeff Beukeboom type or a Keith Yandle type? Um, pretty simply answer. The fact is, u put Ryan alongside Mr. Giveaway over there, and not only will you expose KY for the jelly that he is on D, but you would also turn McD into a tentative, questioning himself, former offensive Dman b/c he would have no faith that his partner will back him up. And rightly so. Of all the Ranger Dmen on the current roster, either Staal or Girardi make the most sense to pair McDonagh with so he can best do his thing, which is confidently play both ends of the ice. Otherwise, it’s Nightmare on 33rd Street. I absolutely agree with this story and everything that this author argue and defended. Listen Ranger fans, McDonagh is amazing, he is our captain, an American born player, and CAN BE offensively minded…but for those of you who think he’s the “next” Brian leatch, well you just are being crazy and not honest with yourself. Honestly, Mcdonagh is a different type of player than Leetch was. Primarily Mcdonagh has ALWAYS been a “defensive minded” first player. He broke onto the scene and then cemented his role and spot on our roster NOT because he was a “possession creating, offensive gifted, puck moving defensemen”. Ryan hasn’t really EVER produced statistically imposing offensive numbers in any of the many different competitive leagues he had played in. For example, check his stats for the United States National Developmental Programs (USNDP-under 21) Junior National teams, or when playing for Wisconsin, or the Wolfpack, or even for the Rangers really. Yes I know people will vehemently jump up and down and point to 2013-2014 season, when he potted 13 or 14 goals and around 43 points, but that really was an exception not the rule. Honestly, if these same pundits would actually take the required time to LOOK at the copious amount of time Mcdonagh spent, not only on the ice per game, but just how much #1 power play time PER GAME he acquired during that year, then one would see that his increase in offensive production wasn’t that amazing or really due to his singular involvement; in fact, although McDonagh’s offensive statistics have been relatively modest thus far in his career, I do feel his SPEED is one of his greatest assets and due to our system, and personnel, I feel he could surpass this years total, and even his top year from 2 years ago. I completely understand fans’ fears that if we put 2 offensively focused and motivated defensemen together, that there would be “issues” with getting “caught with their hands in the cookie jar”–but let’s not miscast Ryan Mcdonagh as a constantly pinching, offensive devoted, and irresponsible risk taking d-men. In MY opinion, even when he’s been giving more opportunity and leeway to take shots and pinch in, play down lower, rotate into the cycle, and lead the rush down low, he has ALWAYS been so concerned about his defensive positioning, assignments, responsibilities, and thoughts that I feel it has compromised his full offensive potential. Also important to note, that when MCD has to play with the “square footed, plotting and flat wheeled” linemate like Dan Girardi, Ryan was ALWAYS and constantly worried about odd man rushes and breakouts due to giveaways/takeaways, and thus this TRUTH had mitigated McDonaghs full offensive potential. Conversely, if our top defensive pairing consisted of 2 offensive D-men, who have statistically proven their dominant puck possession and scoring prowess through the best HERO, CORSI, Fenwick, +/-, and superior point production stats amongst all our Ranger D-men, were paired together, it would ONLY serve our team better and each players individual stats better. Let’s face the truth, allowing our BEST PLAYERS the most chances, and T.O.I. to showcase their abilities, will ONLY bode well for our whole team. Yandle has had THREE 50 point seasons, all of which were with the Phoenix/Arizona Coyotes who without a question have not and DO NOT possess the overall offensive capabilities of our (recent and this years) Rangers team. Can everyone imagine the creativity, offensive potential and overall scoring ability with these 2 paired together?!?! Then we could pair Staal and Girardi together and use them in more defensively sensitive scenarios/zone deployments. Just try and think objectively: how did Chicago use their Top 2 defensemen of Keith, and Seabrook?!?! They played together, and played incredible amounts of minutes in these playoffs/finals. I could continue to drone on for an extended period of time about how MANY teams have a great deal of success using their 2 best offensive defensemen together. All I’m saying is just give the idea a chance before so quickly tossing it from any realm of possibility, and then a decision should be made based on how the team overall is playing. If this tends to create problems, because one pairing doesn’t show enough of something, then at the least Handle should be placed on the 2nd pairing so we can have him on the ice more than last year. Teams that dominate puck possession, obtain more scoring chances, have more shots on and towards the net are always in the top spots in the standings. Therefore we need to utilize our players that help us achieve these goals, and have a track record of such pertinent individually based statistical relevance and dominance.